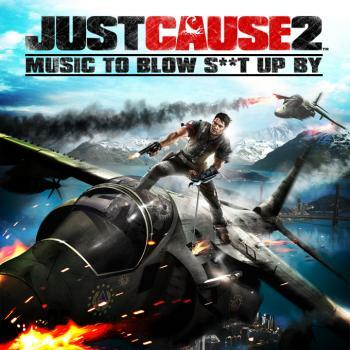 Eidos is giving away Music To Blow S**t Up By, the official Just Cause 2 soundtrack that includes the soon-to-be-smash hit "Pimped-Up Ice Cream Truck Jingle Theme." A lot of game soundtracks are pretty sophisticated affairs these days and quite listenable in their own right, a fact that hasn't escaped the notice of the many game publishers who now offer them for sale as stand-alone products. But Eidos is doing game music fans a double-solid by not only putting together an official Just Cause 2 soundtrack, but by giving it away completely free. With 11 tracks adding up to a total of about 14 minutes running time, it's not the longest collection of music you'll ever run into, nor is it the most focused: Songs run from the hard-driving beat of "Mile High Club" to the banana-republic pomposity of the "Panau National Anthem" and the short-but-sweet "Pimped-Up Ice Cream Truck Jingle Theme." That's not to suggest that this is a half-baked effort, however. Music To Blow S**t Up By is available as an ISO that can be burned directly to CD or as individual 320kbps MP3s, and comes with front and rear covers and even a jewelcase inlay. This is a soundtrack every game music lover should have. It's official, it's free, it has some dude throttling some other dude while he kneels on the roof of a moving truck as something blows up in the background and an attack chopper flies overhead on the back cover: What more could you want? Get it while it's hot at justcause2.com.